Found 7 file extension associations related to ActiveWords and 7 file formats developed specifically for use with ActiveWords. 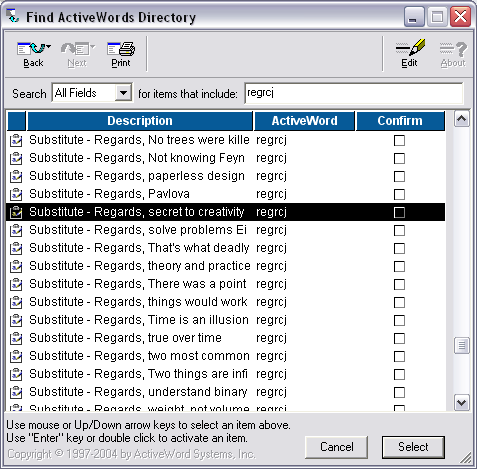 ActiveWords is user interface technology that adds a simple and powerful attribute to Windows, it turns words into actions. You enter or select any words in any context at any time, and are directly connected with services related to the meaning of those words. For example, trigger the word "weather" and a web page showing your current local weather appears. If you need more information please contact the developers of ActiveWords (ActiveWord Systems, Inc.), or check out their product website.